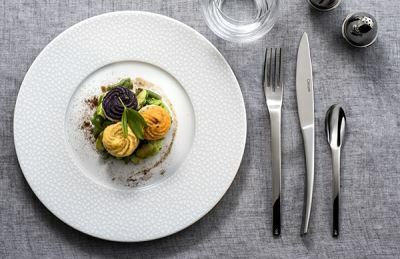 Médard de Noblat capitalizes on its traditional expertise to offer porcelain and stoneware collections that are relevant to all aspects of modern lifestyles. An inspired internal team of designers creates innovative shapes and beautiful dinner sets for home. Glamorous with bright shades and colours, patterns are very rich and tell us a story that has been thought out to the very last detail. Médard de Noblat works with department stores and 400 selected retailers in France and Europe, but is also active in the catering market with white pieces and dedicated collections.